Our Spring 2019 Catalogue is available now as a free PDF download (see below) or if you would prefer a free printed copy, just contact us with your address and we'll put one in the post. As always the catalogue produced this quarter includes reviews of the previous year - this one is no exception. Looking back at 2018 for diesels we have Traction 2018 Part 2, Scottish Diesels 2018 Review and Diesel Hauled Passengers Trains - the Story of 2018. For steam reviews we have: Mainline 2018 Volume 2, Steaming Around Britain 2018, Keighley & Worth Valley Railway - Review of 2018 and the Ffestiniog and Welsh Highland Railway 2018. Other new releases coming this spring include two cab rides: On board a Class 37 from Carlisle to Mossend and then an EMU move around the Glasgow suburbs (ROG Stock Move#3) and if you think that’s a bit different, how about Bristol to Ely via London with a pair of HST Power cars back-to-back! (ROG Stock Move#4). Of course, a new year means two new guide books and I'm pleased to announce that both the London Underground and UK Light Rail guides are back, fully updated and hot off the press in March. At this time of year the Videoscene stall is out and about. After an absence of a few years, in February, we start at the Doncaster show followed by the huge Glasgow Model Rail show. In March, it's Alexandra Palace in London and then April, back to London for the Acton Museum Open Weekend. If you're attending any of these shows, please come along and say hello! You may notice the word 'HOT' next to a few titles in this catalogue. This basically means these are very popular and best selling titles and we have plenty of them in stock. 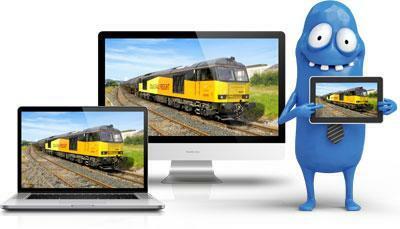 If you order before 12noon on a weekday, we guarantee to ship your order by first class post the same day. Don't forget we still charge £ZERO postage on all DVD/Blu-ray orders to UK addresses. Please don't be paying £2.00 or £2.50 per DVD from other sellers. If the item you want is £14.95, that's exactly what it will cost you - £zero postage - £zero credit card fees - GUARANTEED! Video Downloads - available on this website! We offer many great titles in Standard and High Definition. Once downloaded, you can watch the videos on your computer, mobile device or TV - and the downloads are yours to keep forever. 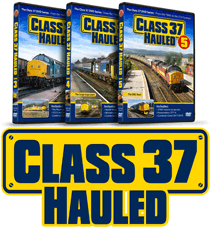 We began producing railway videos on VHS cassettes back in 1994. As technology evolved we moved onto DVDs and more recently to high definition Blu-rays - Video Downloads are another step forward. It isn't a replacement for DVDs and Blu-rays, it’s an additional service we offer. Click here to see our video downloads Click here for more information about our downloads. Available POST FREE to all UK customers - click for details. 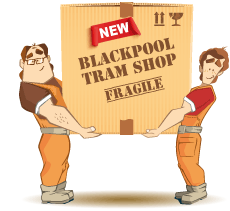 The NEW Blackpool Tram Shop is now open! The new shop is located on the outskirts of Blackpool at Whitehills Business Park, behind the huge B&Q, two minutes from J4 at the end of the M55. The shop is a new-build on a developing complex and on all those winter days of gale force winds and high tides - when we couldn’t open at North Pier - this is very much inland, less windy and drier!